Snap a few unforgettable images of Bali's landscapes at Tegalalang Rice Terrace, a favorite stop for nature lovers, painters, and amateur photographers. Irrigated by traditional methods, these terraced rice paddies provide sustenance for the local farming population and draw international visitors interested in soaking up some of the timeless Balinese atmosphere. You can also visit a nearby village to pick up a few souvenir carvings and learn about the area's rich artistic heritage. Remember to reward local farmers with a small tip if you ask them to pose for your pictures. For Tegalalang Rice Terrace and beyond, use our Ubud online trip maker to get the most from your Ubud vacation. Rice fields are one of the most beautiful landscapes in Bali and Tegallalang rice terrace is one of the landmarks on the must -see list. Very beautiful to look at and a great opportunity to take nice photos. However it has become too touristic and commercial for my taste. They have created some adventure-fun activities like a swing over the rice terraces and photo taking spots where you have to pay and this is a mood changer. In the past this place must have been very tranquil place. It is a tourist trap. It is not difficult to find this place, as it lays on the main road. The local mafia will not let you visit the place for free. If you park your bike, there are parking fee. You want to enter and look at the rice fields, there are admission fee. If you want to cross the bridge and visit the other side, you have to pay another fee. It is not crazy expensive, but you feel like a walking wallet. The landscape is nice, but the fee experience was very bad, we did not really enjoy. If you have a bike, just ride few kilometres further, or on side roads. The terraces rice fields are more beautiful. You can easily walk in, locals will be happy to talk with you. Save your money. Beautiful view of the rice terraces. IDR 5000 donation for parking. Nice to just stop to take a photo. Also a tourist trap where you pay to get photos with some rice farmers dressed up. Better to walk the terraces or explore it early in the morning. But beautiful place to see! I visited both UNESCO rive terrace and Tegallalang rive terrace. I liked this one more. The mechanism of the cultivation is pretty advanced. They follow a step cultivation mechanism and use the rain water to cultivate. It has really good scenic beauty and good place to take photos. Very Beautiful. Many shops along the main road and cafes to enjoy the view. Plenty of scooter parking along the main road as well. A few different swings to choose from. Walking a bit from the main entrance will allow for better pictures with fewer people in them. The paths are narrow, recommend walking or tennis shoes vs sandals. Every day, we help thousands of travelers plan great vacations. Here are some tips on how to use your Listing Page to attract more travelers to your business - Tegalalang Rice Terrace. 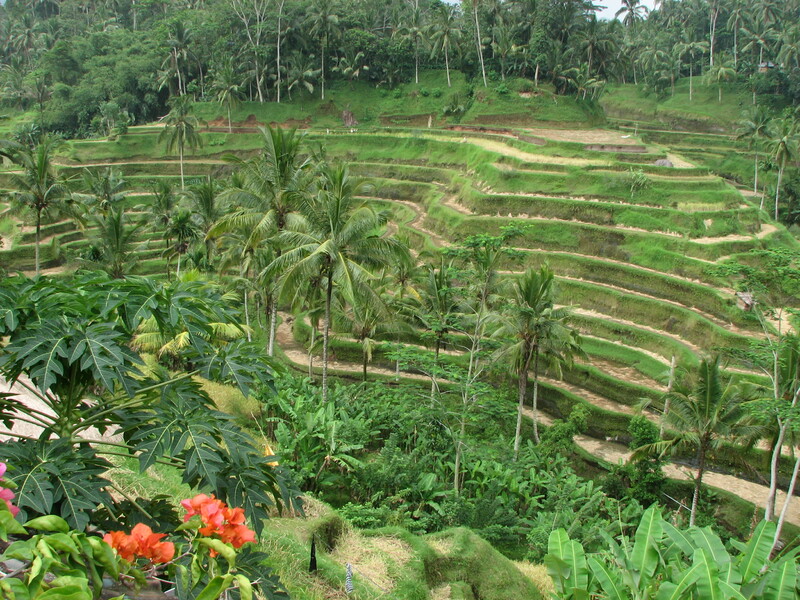 Promote your permanent link - https://www.inspirock.com/indonesia/ubud/tegalalang-rice-terrace-a157596373 - on your website, your blog, and social media. 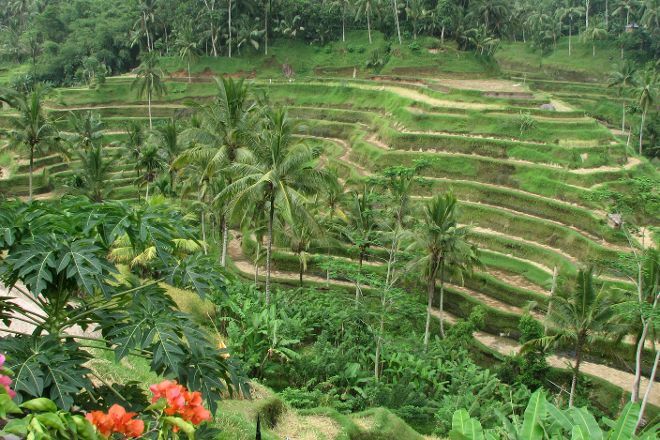 When a traveler builds a plan from this page, the itinerary automatically includes Tegalalang Rice Terrace. This is a great way for travelers looking for a great vacation in your city or country to also experience Tegalalang Rice Terrace. Promoting your link also lets your audience know that you are featured on a rapidly growing travel site. In addition, the more this page is used, the more we will promote Tegalalang Rice Terrace to other Inspirock users. For best results, use the customized Trip Planning Widget for Tegalalang Rice Terrace on your website. It has all the advantages mentioned above, plus users to your site can conveniently access it directly on your site. Visitors to your site will appreciate you offering them help with planning their vacation. Setting this up takes just a few minutes - Click here for instructions.